The College Board found that the average college student spends $1,200 per year on textbooks and supplies. According to a study by the Student Public Interest Research Group (Student PIRGs), that's about 39% of tuition and fees at a community college or 14% at a four-year public institution. 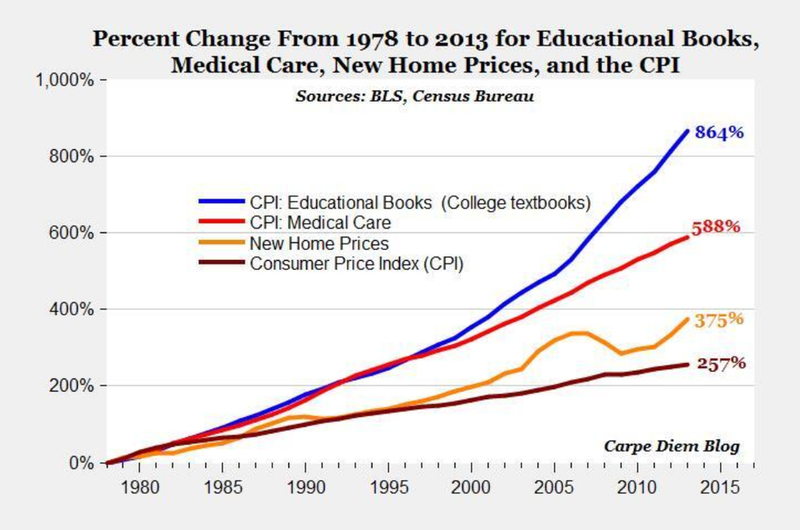 Textbook price inflation is only exacerbating the debt burden on students. The Student PIRGs study argued that the market is flawed in the publishing industry. "In a typical market, there is a direct relationship between consumer and provider," they noted. "The consumer exercises control over prices by choosing to purchase products that are a good value, and the competition forces producers to lower costs and meet demand. "In the textbook industry, no such system of checks and balances exist. The professor chooses the book, but the student is forced to pay the price. Because of this, the student is, in essence, a captive market. Without the ability of the student to choose a more affordable option, publishers are able to drive prices higher without fear of repercussion." Mark Perry, professor of economics at the Flint campus of The University of Michigan, tweeted a chart, that shows just how ridiculous the rise in text book prices has been.